This is a preview of a research report from Business Insider Intelligence. Current subscribers can read the report here. Blockchain technology promises to transform how nearly all industries manage data. Since roaring onto the scene as the engine behind Bitcoin in 2009, it’s become applicable to a diverse array of industries beyond financial services, including industrial manufacturing, healthcare, and logistics. The common thread between these industries is that they all feature complex supply chains, large numbers of interconnected players, and vast amounts of data. The digital advertising industry shares those characteristics as well. These characteristics, combined with the industry‘s transparency issues, make advertising a prime candidate for blockchain solutions. Blockchain can help solve one of the advertising industry’s biggest challenges: opaque advertising practices. 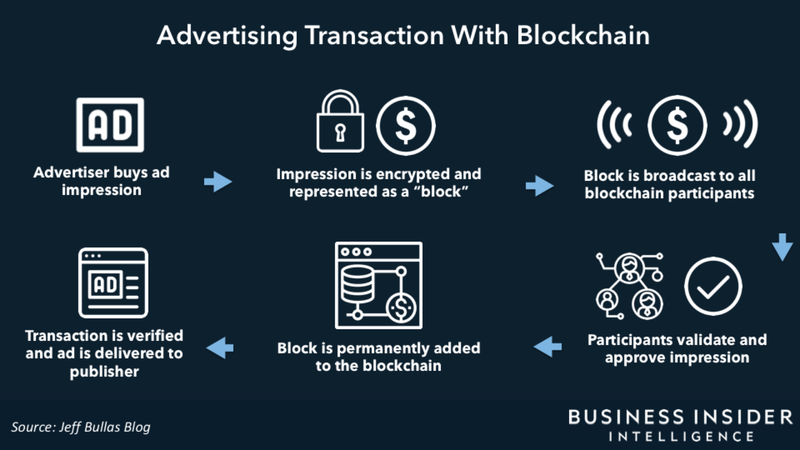 Publishers, advertisers, and ad tech vendors are exploring blockchain as a tool to boost transparency around ad practices, with the end goal of reducing fraud. Ad fraud is expected to cost the industry $44 billion by 2022, up from $19 billion this year, according to Juniper Research estimates. Through its function as a public database, blockchain can store information about a digital advertisement, like who has created it, while sharing it with everyone else on the network in a verifiable and immutable way. For digital advertising, that means ad impressions can be tracked along the supply chain, and advertisers can record where an ad is delivered. In this report, Business Insider Intelligence will explain what blockchain technology is and how it can inject transparency into the advertising supply chain. We will then highlight the significant hurdles to adoption, and propose different ways the industry could navigate those challenges. Finally, the report will profile companies that are at the forefront of the blockchain advertising space to give advertisers an idea of what blockchain looks like in practice today. The companies mentioned in this report are: Basic Attention Token (BAT), IBM, Kochava, and MetaX. Blockchain promises to mitigate ad fraud through its function as an immutable public database, which allows it to store and validate previously murky information about digital ads. Despite this promise, just 11% of advertisers and agency executives have completed an ad buy using blockchain technology, according to an Advertiser Perceptions survey. Limited adoption is the result of several significant hurdles — like ad executives’ skepticism around the technology’s usefulness — which must be overcome before blockchain is widely accepted. Blockchain is heralded as a transformative technology, and while it has that potential, it’s not quite there yet for advertisers. Still, it shouldn’t be dismissed as “pie in the sky” — blockchain presents several short-term use cases for advertisers, and those who take advantage will be set up for long-term success as the technology matures. Highlights how blockchain technology works, and how it can be integrated into the advertising supply chain to improve transparency. Outlines practical, low-risk ways marketers can prepare themselves to benefit from blockchain including using smart contracts, registering domain names, and exploring tokens that reward consumers for use of their data. Profiles several companies at the forefront of the blockchain advertising space, gaining industry-wide recognition as thought leaders.